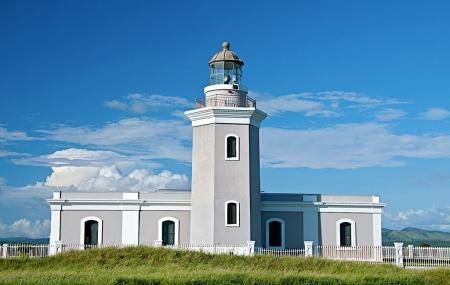 The El Faro Los Morrillos, also known as Los Morrillos Light is a historic lighthouse in Cabo Rojo. It is situated atop 200-foot limestone cliffs overlooking the spectacular Caribbean Sea, as it marks the south west tip of Puerto Rico. The lighthouse has been renovated over the years and is still functional, but it also serves as a tourist centre that covers the history of the lighthouse. Apart from being a heritage monument, its location and the surrounding views make it a favourite amongst visitors. The lighthouse itself is relatively small in scale, though it is still useful in helping ships navigating around that point. The tourist centre houses a brilliant photo exhibit of the lighthouse, and you can also walk up the spiral staircase of the lighthouse, which takes you to the observation deck on the roof of the monument. From here, you can enjoy some exceptional panoramic views from the very tip of Puerto Rico, around the limestone cliffs and over the great blue sea. There are ‘park rangers’ at hand to help you with information about the area and the history of the lighthouse. You can venture around the lighthouse on the limestone cliffs for some picturesque photo opportunities. Be careful not to wander too close to the cliff! The El Faro Los Morrillos is more than just a monument. It is one of the most popular tourist spots in Cabo Rojo, and provides us with a gentle reminder of the rich heritage of Puerto Rico. Bathroom facilities are available in the lighthouse. The parking area is a short distance away from the lighthouse, so be prepared for a short walk up to the monument. Don’t forget to bring a hat, water and some mosquito repellent. The lighthouse was newly refurbished in 2014. You now also have the option of taking a trolley from the parking area to the lighthouse, which runs every ten minutes or so. To get to the lighthouse, drive past the salt flats on Route 301, at which point the road changes from asphalt to packed dirt. Beware of potholes. How popular is El Faro Los Morrillos? People normally club together Playa Sucia and Miski Mikuna while planning their visit to El Faro Los Morrillos. This is one of my favorite places in Puerto Rico. The drive to this place shows how diverse the island is. It is filled with rolling grassy hills that morph into the salt processing farms of Cabo Rojo. Parking can be tricky, but it is well worth the trouble. As it is a national park, there are designated places to park and a bus is usually available to take you to the light house. In the lighthouse, there are informational displays that talk about the history of the island. After enjoying the lighthouse, the real fun begins. To the east there is a wonderful white sand beach in a delightfully calm lagoon. Or if one is up for more adventure, they could walk down the west coast and experience the breathtaking views from the cliffs. Make sure to visit the arch that is on the west side. If you are brave, get pictures of yourself standing on the arch. It will be your favorite memories from the trip I promise. Certainly one of the most beautiful spots in all of Puerto Rico due to the sheer cliffs next to the ocean. The beach next door is beautiful and there are plenty of trails to hike. This part of PR is more dry than the others so expect a lot of sunshine! One of my favorite spots in Puerto Rico. Sea cliffs, horseshoe Beach and a restored lighthouse. Stay for sunset, you won't be disappointed. Restored after the. Hurricane. Worth the drive down the dirt road passed the salt flats. Bring stuff no services there. View is amazing and the beach in the cove below is wonderful. Make sure you sing as you walk on the beach on quite days so you can warn the people your coming their way. Very nice, was a clear sunny day. Dirt road has been recently repaired. Lighthouse was opened, but there was no trolley for persons with walking in issues. Other that that was a great experience.